Mark Sturtevant sent in some photos in response to my plea for wildlife pictures, but I’d lost this earlier contribution of his. Mark’s notes are indented. I have many favorite area parks to take the camera, but nothing is like the Magic Field, which seems to effortlessly harbor numerous species of arthropods that I just don’t see anywhere else. 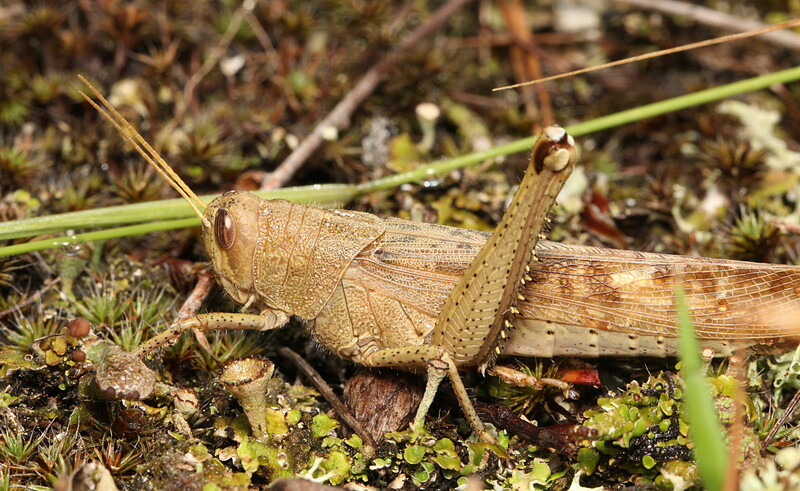 The first two pictures show an example, which is a large ‘bird’ grasshopper (genus Schistocerca). When taking flight they can fly especially long distances, and no wonder since this is one of the genera of grasshoppers that include swarming locusts. I personally think the one here is S. rubiginosa, which of course is not a swarming species. Actual locust swarms have not been recorded in the U.S. for many decades, as summarized here. 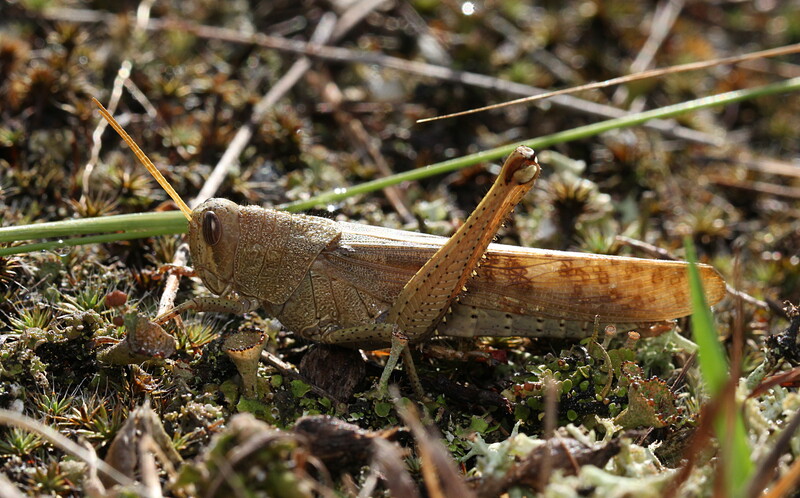 In any case, these grasshoppers are normally very alert and they are hard to approach, but this one was chilled by a summer afternoon. rain. The ground is also interesting here, as you can see the mosses and fruiting bodies of lichens which cover the ground in the Magic Field. 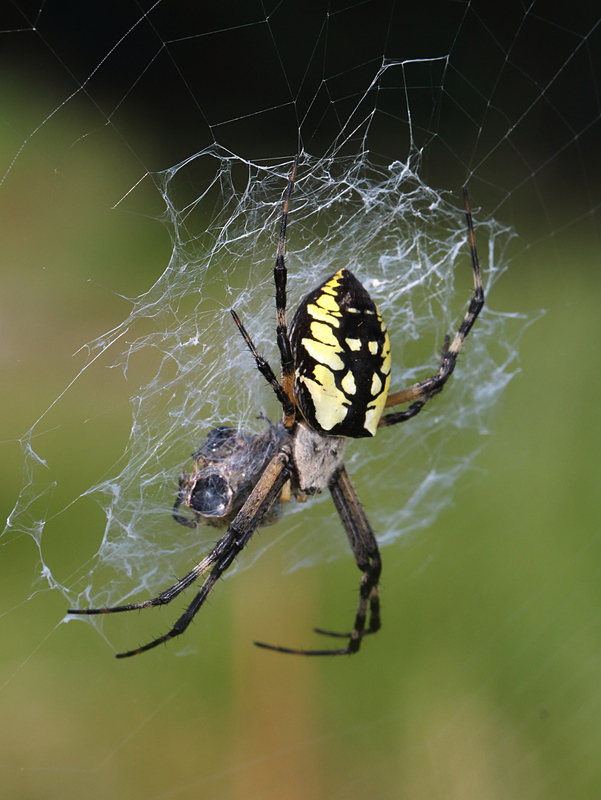 Next is black-and-yellow argiope garden spider (Argiope aurantia). I grew up with these lovely spiders, but I had not seen them where I now live until recently. Finding them was like meeting a long lost friend. As I kid, I would collect several of these spiders and let them spin webs in my bedroom. I am not allowed to do that now…. 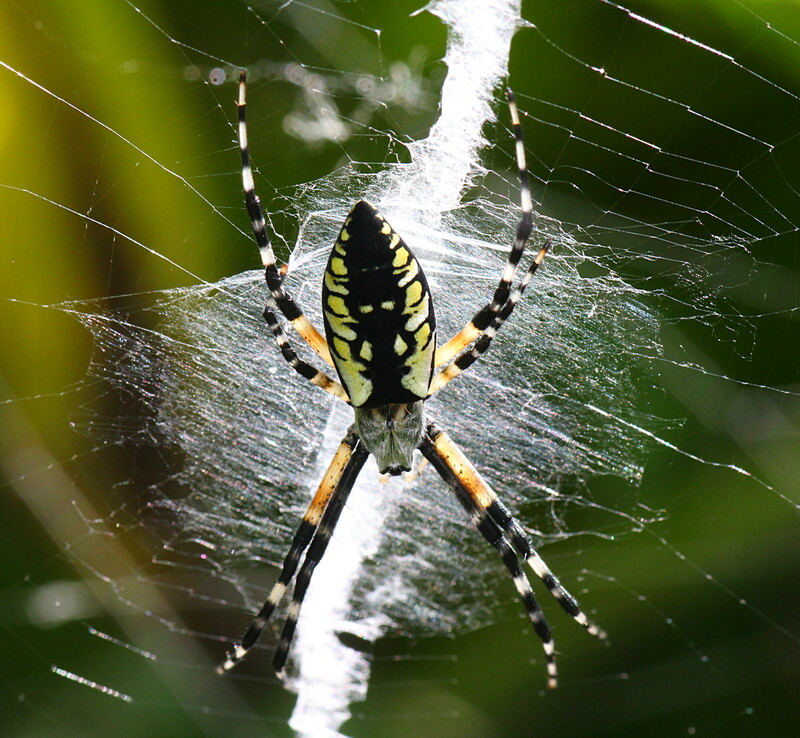 The next picture is a species of banded argiope (Argiope trifasciata). These are smaller but more common than the black-and-yellow species. This particular one was missing a leg, but I managed to ‘correct’ it with the magic of post-processing. On milkweeds, one can often find the tussock caterpillars (Euchaetes egle) shown in the next two pictures. They really do resemble small mop dogs, don’t they? Mature larvae are usually off by themselves, like the first picture, but younger ones are often in small aggregations like the second picture. The adult moths of these insects are a kind of tiger moth. 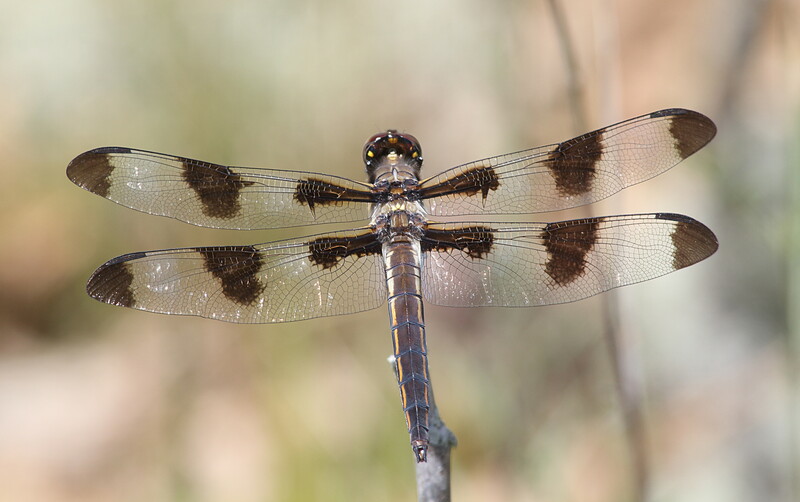 The rest are pictures of twelve-spotted skimmer dragonflies (Libellula pulchella). Both of these are males. Young males, like the one shown in the first picture, are especially common far from water. Mature males develop additional white spots, as shown in the last picture. These are often seen next to water where they take to defending a territory that is attractive to females of their species. This entry was written by whyevolutionistrue and posted on October 28, 2018 at 7:45 am and filed under insects and other arthropods, spiders. Bookmark the permalink. Follow any comments here with the RSS feed for this post. Both comments and trackbacks are currently closed. Wonderful photos and background info. “I am not allowed to do that now…” Lol! Nice. 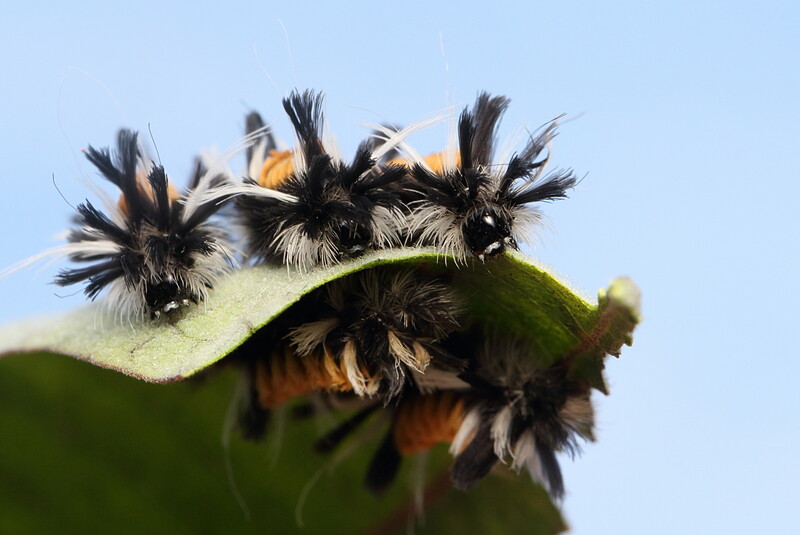 I like the punk rock caterpillars. Me too. Milkweed gets the coolest bugs. Since you post-processed the Banded Garden Spider back whole again, I can’t help wondering how the creature’s brain adapts to a missing limb. A spider’s movements and astonishing skill with web-making seem to imply that the brain is very carefully wired to coordinate the limbs. I’m sure it gets along fine with the loss of a limb, so just what happens in the brain to keep things properly orchestrated? No idea. i expect they do fine in part because there is some redundancy with 8 legs. A 7 legged spider might be a little slower, and a little less nimble in wrapping up their prey. But not by much. 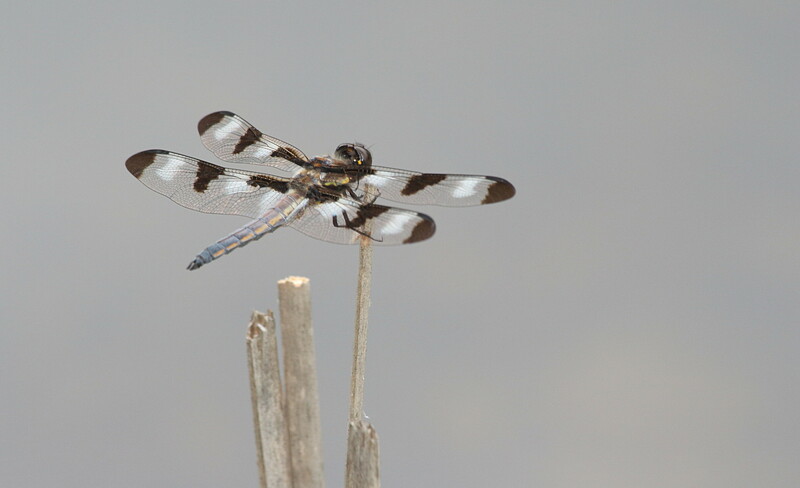 I just love the closeup of the wings on that dragonfly. Really lovely photos. Great photos! Like the detail closeups show. 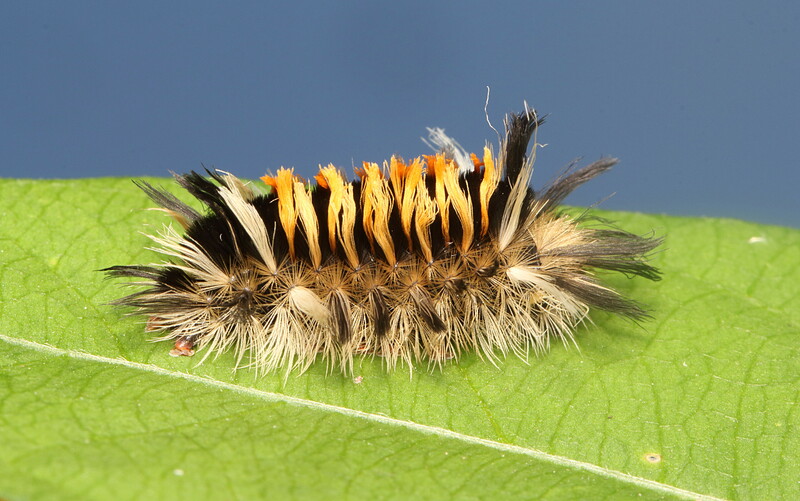 It’s a good idea not to touch tussock moth caterpillars: the “hairs” may have a substance that causes itching in some people. Great set of pictures. Like you I am fond of the Argiope spiders. The species I am familiar with is Argiope bruennichi which is sometimes known as the wasp spider because of its bold yellow and black markings. Sadly the species does not occur in the North of England where I live but I am familiar with it from France and Germany where it can be abundant in grasslands. I liked to show people how slightly disturbing them elicited that web-vibrating thing they do. Great link about the locusts. I’ve read a little about these before–almost makes me wish they were still around to witness, destructive though they be. 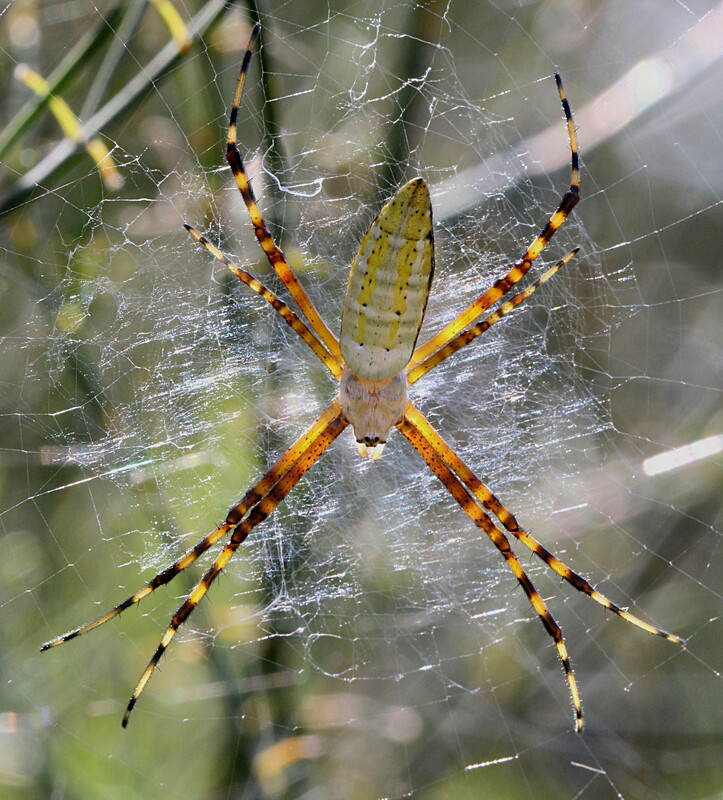 The zig-zag pattern you see woven into her web is called stabilimenta – once thought to add stability to the web, we now know they are effective in helping to keep large flying objects (such as birds) from crashing into spider house. I had always wondered about that.